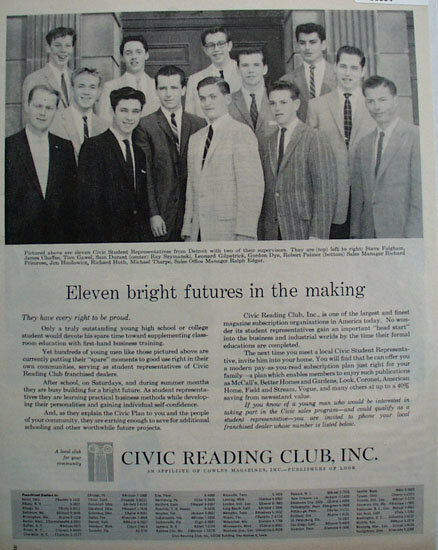 Civic Reading Club 1959 Ad. This black and white February 17, 1959 ad states eleven bright futures in the making. Young men representatives of the Civic Reading Club Franchised dealers. Pictured are from Detroit, Steve Fulgham, James Chaffee, Tom Gawel, Sam Durant, Ray Szymanski, Leonard Gilpatrick, Gordon Dye, Robert Palmer, Jim Hmilowicz, Richard Huth, Michael Tharpe and Sales managers Richard Primrose and Ralph Edgar. Magazine tear sheet picture is taken through plastic and may show wrinkles or crookedness that is not in the ad. This Original magazine tear sheet measures 10 1/4 inches wide by 13 1/4 inches tall. Items Similar To "Civic Reading Club 1959 Ad"